From the day they were ordered, the D600 'Warship' class were the locomotives the Western Region did not want. The WR required lightweight diesel - hydraulic engines of the German design, similar to the Krauss-Maffei V200 locomotives, whereas the British Transport Commission ordered this heavyweight class of 5 to be built on diesel - electric principles. 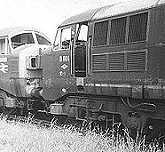 The BTCs vision was for the D600 class to be the equivalent of the 2,000 hp diesel - electrics being built at the time, although some may argue that the BTC allowed the WR to have their own way and then watched at this new form of transmission failed miserably. All five members of the D600 class were built by the North British Locomotive Company in Glasgow and on completion, each was to cost £87,500. An A1A - A1A axle arrangement was used with the centre axles unpowered. 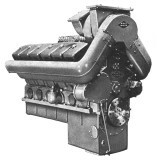 MAN L12V18/21A engines, each giving 1,000 bhp at 1,445 rpm were coupled to Voith L306r transmissions. The V12 engines for the first two locomotives, D600/1, were built by MAN in Germany while the other engines were built by NBL under licence. The Voith transmissions, which were a tried and tested design as used in some of the Krauss - Maffei V200 locomotives, was set to change speed at 29mph and 57mph. The underframe of the D600s was built like a tank. Using ' I ' section beams and cross - members which were riveted and welded together and topped by a thick sheet steel floor with aluminium bodywork, the total weight of each locomotive to 117.4 tons. Names for the locomotives were given in alphabetical order after five famous warships, Active, Ark Royal, Bulldog, Conquest and Cossack and the locomotives were supplied in standard BR green livery with a blue - grey line at the lower edge of the bodysides. One characteristic of the D600s, and also the D6300 class, was the use of spoked wheels. Several small engine and transmission faults were noticed soon after the class were introduced. These components were then returned to NBL for repair due to a contractual agreement with the WR, however, this meant that locomotives would be out of service awaiting spares or repairs. In addition, the Spanner Mk1a train heating boilers fitted to all early diesels were very suspect. On average, engines were replaced after 8,000 hours in service ( there are 8,760 hours in a year ) while the locomotives generally clocked 65,000 miles annually. By 1961 the D600 class became more and more reliable, however as a greater number of D800 'Warship' locomotives became available, and the non - standard D600s were assigned to less demanding duties. By 1966 a large number of engine and transmission spares were required, and with NBL no longer in business by this time, availability and running costs weighed heavily against much further use of the class. In addition, the BTC wanted to standardise the locomotive fleet, so by December of 1967, all five members were withdrawn. D600 and D601 were sold to Dai Woodhams of Barry and numbers D602, D603 and D604 travelled to Cashmore's at Newport. These three locomotives were cut up by the end of 1968, whereas D600 Active was not scrapped until March 1970. D601 Ark Royal was the subject of a failed preservation attempt and languished at Barry for further 10 years before eventually being cut up in July 1980.